← Beyond The Sea – and Sky! Before people went on pilgrimages to Canterbury to see the shrine of Saint Thomas a Beckett, they went on pilgrimages to Winchester – and the saint at the centre of that was Swithun. Lovely Laura, the jazz singer, reminded me about that over breakfast that day at Parsonage Farm and I realised that, by contrast with knowing about the murder of Saint Thomas a Beckett in The Cathedral and who as well as what led up to it, I knew nothing at all about Saint Swithun and the nature of pilgrimages around him. So thinking it might have some relevance for understanding the pilgrimages of Chaucer’s day, and to distinguish the “Swithunian” journey from those of the people I’d first met in 1991 taking either the Canterbury road or the one to “Camelot”, I thought I’d check out what he did, including what difference were in pilgrimages made to “experience his blessing” by contrast with the calling to Canterbury. Much to my surprise, by contrast to the more mindfully centered (and perhaps politically oriented) pilgrimages to Canterbury, the object of pilgrimages to Winchester seemed solely (if you’ll pardon the pun) about seeking hope or finding miracles. Indeed, from all accounts, more miracles were associated with Saint Swithun after his passing than from anything remarkable he seemed to have achieved in his lifetime. Well, from all accounts I’ve read so far at least. Some pilgrims even seem to have come to Winchester due to something about Saint Swithun’s day (15th July) being seen as providing the long range weather forecast of the Dark Ages, as whatever weather prevails on that day can be expected to be the same for the next forty nights. So it may well be that there were more practical reasons to pay homage to Saint Swithun’s remains – such as needing to know if there was going to be more rain to help things grow in a time of drought, or perhaps more sunshine and so need to conserve water. Whatever the case may be with the magic or miracles of Saint Swithun, clearly pilgrimages only became more personally and politically inspired after the Norman conquest of 1066. Indeed, given the greater power over popular opinion shown through Saint Thomas’ martyrdom, I can see how King Henry VIII would have wanted to destroy the shrine of Saint Thomas to undermine any others with such aspirations. In fact, perhaps it was also why he chose to eat swan too, so he could symbolically show he was not afraid to take the step towards divorce that was eschewed by the Catholic Church, given it was known that swans mate for life. So I can well understand how political motivation could be an acceptable reason for making a pilgrimage, as a quiet form of protest against the establishment (and interestingly by both Anglican and Catholic alike, as I understand it later turned out), however I find myself intrigued by the idea of people taking a pilgrimage for mystical reasons. Indeed, mystical pilgrimages still happen today. I understand that people hold the same sorts of hopes for small miracles or revelations along the way to Santiago De Compostela (including my young Greek Cypriot barber I recently discovered). This is what drives some to take the full 800 km road over the Pyrennees from France and all the way across Spain to there to follow in the footsteps of the Apostle Saint James, as the movie “The Way” shows that has recently been released here in the UK and Ireland. There are also similarities in this tour, so I understand, to how Australia’s Aboriginal peoples are, or were reputed to, “go walkabout” and are somehow able to find sacred places known only to their ancestors. Certainly I was led to believe that from a story told to me by a young lady I met in Biarritz back in 2006, and who also told me that there are such trails all over Europe, not just in Spain. The interesting thing was that this chance encounter, in itself, was made as part of tracing parts of the Camelot story to Brittany and other parts of Europe – where I was surprised to find they originate from, and rather than from SouthWest England as I had first thought way back in 1991. From what I’ve read – and part understand now from my own experience, any such mystical journeys should not be taken lightly, and are not something you’d just do as an excuse for meeting some new people between seasons, and having a good holiday as we know it. Atoning for some sort of pennance, or having a personal if not spiritual reason for the journey is necessary, and ideally a higher or mystical calling – as is written about by Paolo Coelho in “The Pilgrimage” or “The Alchemist” and other books. However, given the celebrity factor of people like Mr. Coelho taking such roads – and so embuing them with something more (like some go to see the set of the movie “Notting Hill” here in London’s Portobello Road), I am wondering whether some of those who now make the journey to Santiago de Compostela are perhaps less like those who made the journey to see Saint Swithun back in Anglo-Saxon days, but are more like those who are obsessed with celebrity, and so making the journeys to places such as Graceland in the hope of meeting someone famous or finding something from the reflected glory (hallelujah) of Elvis’ story. Paul Simon captures the grasp of Graceland beautifully in his song Graceland <<link – have a listen on the previous link, and note the lyrics. If so, thank you. Thank you very much. You’re beautiful. Maybe we can even find something romantic – if not spiritual – in that journey too, somewhere along the way…. Seriously though, the saints may well have been the spiritual celebrity of the Dark Ages day, just like Merlin, King Arthur and the Knights of the Round Table were then and are perhaps even still now, however nowadays I feel it is famous people – and those seeking fame – that leads or takes us places, and not necessarily with fortune included. Still, it’d be nice to think that there is really something magical, if not more, beyond the mere political and physical planes….. 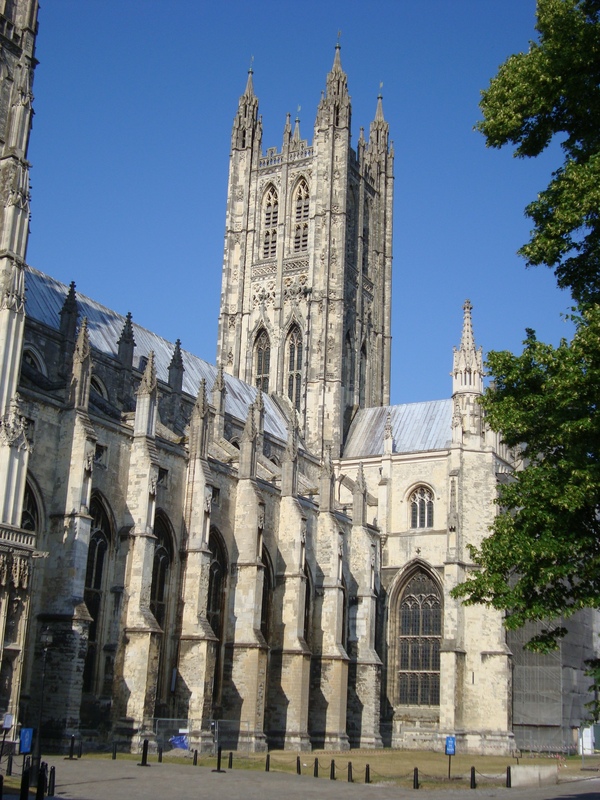 This entry was posted in Camelot, Canterbury, Pilgrimages, Winchester, Writers and tagged Camelot, King Arthur, Merlin, Paolo Coelho, Saint Swithun, Saint Thomas a Beckett, saints, Santiago De Compostela. Bookmark the permalink. fab, fab, fab. loved Winchester. St Swithun’s hey! cool. still to get to Canterbury…..and cant wait to do the Camino albeit not for spiritual reasons. (my dad already gave me a lecture about that!). I want to do it just because. but if you do go to Graceland……you know where I am 🙂 hahahaha. btw….I used Paul Simon;s song for my daughter’s 21st…..diamonds in the soles of her shoes 🙂 was part of a musical speech I made. Yeah, my interest in El Camino would be more out of curiousity – though 6 to 8 weeks, and walking 800km in that time, seems like one helluva lot of curiousity!